The 2012 IECC has an airtightness requirement of 3 air changes per hour at 50 Pascals test pressure for both single family and multifamily construction in Climate Zones 3-8. Other programs have similar or tighter compartmentalization requirements, thus driving the need for easier and more effective methods of compartmentalization in multifamily buildings. Firewalls, demising walls, or area separation walls have been identified as the major source of difficulty in air sealing/compartmentalization, particularly in townhouse construction. The current research examined the use of the taping of exterior sheathing details to improve air sealing results in townhouse and multifamily construction, when coupled with better understanding of air leakage pathways. The 2012 International Energy Conservation Code (IECC) has an airtightness requirement of 3 air changes per hour at 50 Pa test pressure (3 ACH50) for single-family and multifamily construction (in climate zones 3–8). The Leadership in Energy & Environmental Design (LEED™) certification program and ASHRAE Standard 189 have comparable compartmentalization requirements. ASHRAE Standard 62.2 will soon be responsible for all multifamily ventilation requirements (low rise and high rise); it has an exceptionally stringent compart- mentalization requirement. These code and program requirements are driving the need for easier and more effective methods of compartmentalization. Builders and practitioners have found that fire-resistance rated wall assemblies are a major source of difficulty in air sealing/compartmentalization, particularly in townhouse construction. This problem is exacerbated when garages are “tucked in” to the units and living space is located over the garages. The current research examined the taping of exterior sheathing details to improve air sealing results in townhouse and multifamily construction, when coupled with a better understanding of air leakage pathways. Current approaches are cumbersome, expensive, time consuming, and ineffective; these details were proposed as a more effective and efficient method. The effectiveness of these air sealing methods was tested with blower door testing, including “nulled” or “guarded” testing (adjacent units run at equal test pressure to null out inter-unit air leakage, or “pressure neutralization”). Pressure diagnostics were used to evaluate unit-to-unit connections and series leakage pathways (i.e., air leakage from exterior, into the fire-resistance rated wall assembly, and to the interior). The National Renewable Energy Laboratory (NREL) and the Standing Technical Committee on Enclosures presented top priorities for research in their document, “Building America Technical Innovations Leading to 50% Savings – A Critical Path” (NREL 2013). The document stated that multifamily residential buildings comprise a significant segment of the residential building stock, and these buildings are on the critical path for achieving energy savings at scale. Building America has goals of reducing home energy use by 30%–50% (compared to 2009 energy codes for new homes and pre-retrofit energy use for existing homes). Of course, air leakage is a significant contributor to heating and cooling energy use (particularly in cold and mixed climates). This measure will result in energy improvements proportional to the reduction in air leakage that production builders can cost-effectively achieve. Retrofit work has sometimes revealed catastrophic air leakage at fire-resistance rated wall assemblies. Addressing this leakage in a manner that satisfies local code officials (in terms of maintaining the fire performance of the rated assembly) can result in significant savings. The primary benefit to improved airtightness is reduced heating and cooling energy use. Greatly reducing or eliminating uncontrolled air leakage also increases occupant comfort and reduces the risk of air leakage-based condensation failures of building enclosures. In mixed-humid and hot- humid climates, these measures improve the ability of space conditioning systems to control interior humidity levels. In multifamily construction, research has shown that good compartmentalization is vital for fire, smoke, odor, contaminant, and sound control. In multistory/high-rise construction, compartment- alization can ensure more reliable suite ventilation in buildings with common ventilation systems. These issues are summarized in the literature search presented by Finch et al. (2009), and are covered in work by Hill (2005, 2006). Environmental tobacco smoke is an airborne con- taminant of particular concern; measurements of compartmentalization before and after retrofit airtightness measures were studied by the Center for Energy and Environment (CEE 2004). Section 2.1 is a literature review on multifamily air leakage and compartmentalization. Section 2.3 summarizes the current applicable air leakage targets and metrics. Section 2.4 presents information about exterior air barriers and taped sheathing. Compartmentalization, as a concept, dates back to the Empire State Building during the Great Depression. It was espoused as an approach to deal with durability, fire safety, comfort, and indoor air quality in high-rise and multifamily construction. However, the concept was not formally memorialized until Handegord (2001). Work was done in Canada by Hill (2005, 2006) and overseen by Handegord for Canada Mortgage and Housing Corporation. Hill (2005) tested airtightness in eight suites in a new multi- unit residential building; leakage rates were 1.2–3.2 ACH50 (2.2 ACH50 average, 0.75 ACH50 standard deviation). This included leakage from the exterior and to common spaces and adjacent units; the airflow from exterior and interior spaces appeared to be roughly comparable. These high-rise unit results are likely not directly comparable to low-risk, wood-frame townhome construction. The building ventilation system was designed with door undercuts at the hallway to provide make-up air for exhaust systems; flows were lower than specified; operating multiple unit exhaust fans resulted in significant depressurization (–20 to –75 Pa). This depressurization reduced the flow from some exhaust fans, as they were forced to “compete” for air. 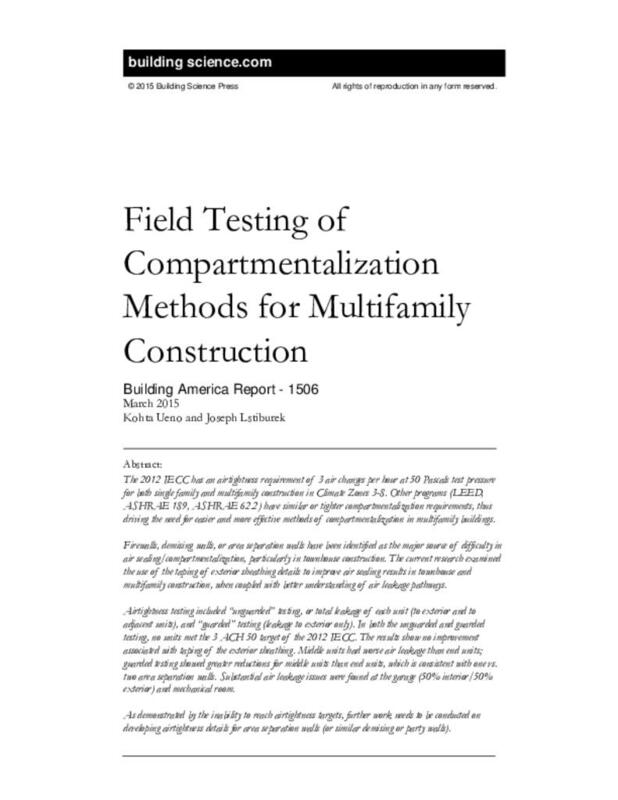 Hill (2006) tested compartmentalization techniques in two suites in a high-rise multiunit residential building, using the airtight drywall approach at demising walls; the units were tested and compared to conventionally constructed units. The results were generally encouraging; the test units had lower normalized leakage relative to similar units. The test units achieved tightness levels of 1.8 and 2.2 ACH50; conventional units ranged from 1.3 to 4.6 ACH50. Leakage locations included plumbing, electrical, and mechanical penetrations, windows and window-to- wall joints, and interior wall sill plates. Gadgil et al. (2006) compiled data (Residential Energy Consumption Survey and similar) on air leakage of apartment (multiunit residential) buildings, and “commercial” (nonresidential) buildings. They concluded that these buildings were roughly twice as leaky as single-family homes (as a surface area-normalized metric). They reiterated the fact that indoor-to-outdoor air leakage and unit-to-unit air leakage are interrelated: in poorly compartmentalized buildings, leakage from one suite can influence leakage in other units. They cite literature stating that commonly, 10%–40% of the air coming into apartments originates from other units, not from the exterior; some cases report that 100% air leakage is supplied from other units. They also warned that improving indoor-to-outdoor airtightness in apartment buildings without addressing unit-to- unit airtightness might result in greater pollutant exposure to occupants. Genge (2007) discussed measurement of air leakage in multiunit residential buildings, driven by LEED requirements in multifamily buildings. He noted the importance of leakage to the exterior and compartmentalization. He discussed equipment and procedures for executing multiunit residential building tests, including running multiple calibrated fans, at one per floor. By sequentially adding fans at a fixed test pressure, this method can measure leakage to the outside as well as leakage to adjacent interior spaces (“nulling” test). Finch et al. (2009) measured air leakage in six suites in four multiunit residential buildings, with a focus on leakage rates through isolated wall and floor/ceiling assemblies, and providing baseline data. He performed nulling or “pressure neutralizing” tests, noting that they are costly and time intensive, and therefore not common. He had an extensive review of the North American and European literature, including studies on isolating air leakage of various enclosure components. The overall leakage measurements were over a wide range (2.6–14 ACH50, 4.3 standard deviation); more interestingly, there was substantial variation in terms of the air leakage location, between various suites. A range of 33%–80% of the leakage came from the exterior; common areas/hallways comprised 11%–52% of the total leakage. Wood-frame walls were found to have higher leakage than steel stud and gypsum board walls covered with self-adhered membrane. Low air leakage to the exterior was correlated with higher wintertime interior relative humidity, based on long-term monitoring. Iain Walker of Lawrence Berkeley National Laboratory covered ASHRAE Standard 62.2’s application to multifamily buildings, including the compartmentalization requirement added in Addendum j. He noted that this level of airtightness will have effects on unit depressurization and combustion air. Srikanth Puttagunta of Steven Winter Associates, Inc. presented on guarded, unguarded, and zone pressure diagnostic testing of a new construction townhome project. There was some discussion on measurement anomalies that suggested fundamental problems with nulled testing; representatives from The Energy Conservatory (TEC) (testing equipment manufacturer) also contributed to the discussion, offering potential explanations. Chase Counts of New River Center for Energy Research and Training (NRCERT) presented on developing a protocol for auditing low-rise multifamily complexes based on its experience with roughly 40 such tests. He covered methods and equipment, noting the extensive manpower and logistics requirements for large-scale testing. Michael Lubliner of Washington State University covered multiblower door testing of low rise multifamily buildings, including results from guarded and unguarded apartment leakage tests, from pre- and post-retrofit weatherization and installation of dense pack wall insulation. Otis and Maxwell (2012) presented a Building America Measure Guideline on air sealing of attics in multifamily buildings. It included air sealing methods for a variety of conditions, from row houses with easy attic access, to older masonry townhomes with no access without removal of the ceiling finish. Details were provided addressing fire-rated wall assembles between units. It included case studies on retrofit air sealing of three types of multifamily buildings. Klocke et al. (2014) discussed the challenges of achieving the 3 ACH50 requirement of the 2012 IECC in multifamily dwellings. In particular, they noted that in multifamily construction, air leakage originates both from outside and interior sources; the latter has less influence on energy performance because of a minimal temperature difference. Previous comparisons of guarded testing (running units at the same pressure to eliminate inter-unit leakage) and unguarded testing showed a 22%–27% reduction in air leakage. They presented results from roughly 600 high performance apartment air leakage tests (unguarded). Most (90%) met the ENERGY STAR® multifamily requirement of 0.30 CFM50/ft2 enclosure; roughly half met a standard of 0.25 CFM50/ft2 enclosure; only 10% met the rough equivalent of 2012 IECC (3 ACH50). Klocke et al. performed unguarded testing in three low-rise multifamily new construction projects in New York. They examined variables such as unit vertical (bottom/middle/top) and horizontal (end versus middle) locations. Typical unguarded air leakage values were in the 4–6 ACH50 range; one project had noticeably better leakage numbers due to the use of spray foam in demising walls. The best of the three projects had 50% of units meeting 3 ACH50; other projects had 12% and 0% meeting the requirement. The team proposed a change to the building code, to switch from the 3 ACH50 target to a surface-area based target of 0.25 CFM50/ft2 enclosure in low-rise multifamily buildings. They also proposed language for a sampling protocol in multifamily testing. Some practitioners have examined the issue of air leakage associated with fire-resistance rated assemblies or area separation walls in multifamily buildings. A typical assembly is the Underwriters Laboratories (UL) U347/U373/U336 2-hour rated assembly. Holton and Prahl (2005) examined the issue of air leakage at these fire-resistance rated assemblies (area separation walls) in multifamily buildings (such as side-by-side townhomes). They noted that poor thermal performance (specifically, air leakage) has negative results for energy efficiency and comfort. One example was air leakage from the party wall into a vented (unconditioned) attic, resulting in heat loss and ice dam issues. Many party wall designs call out for an air space between the fiberglass batt stud bay insulation and the 1-in. gypsum shaft liner board core, resulting in an air leakage path that can be connected over multiple floors. The authors questioned whether this air gap is actually necessary for fire performance. Many fire- resistance rated walls provide both interior-to-interior and interior-to-exterior separation (because planes shift between units): this condition increases the risk of air leakage. Although the core of the wall (double-layer 1-in. gypsum shaft board, typical) is relatively monolithic, the wall assembly to either side of the core has many mechanical, electrical, and structural penetrations, which are thus in turn connected to the air space. Similarly, bathtubs and stairwells on common walls have high risks of air leakage. Assemblies need to be developed that improve airtightness and simultaneously address fire, acoustic, and moisture issues. At the same time, air sealing details must be durable and accommodate movement. The authors demonstrate a series of common problematic air leakage details at fire-resistance rated walls, with proposed solutions. Prahl continued this work, proposing changes to the International Residential Code (IRC) and International Building Code to allow for limited quantities of sealants at these critical details (ICC 2013). However, the committee rejected this proposed change, which was the focus of continuing effort under the Building America program. Rudd and Prahl (2014a) proposed a plan to engage with stakeholders on using air sealing materials in fire-resistance rated wall assemblies (area separation walls), including a collation of the relevant IRC, IECC, and ASTM materials. Among other sections, they cite the sections of the IRC (ICC 2012b) relevant to fireblocking of cavities (§R302.11), which calls for cutting off “concealed draft openings” in wood-frame construction at ceiling/floor levels, horizontally every 10 ft (maximum), at soffits/drop ceilings, and stairs, among others. These fireblocking requirements essentially correspond to the air sealing of cavities of fire-resistance rated wall assemblies. They note that the fireblocking materials described in §R302.11 should be acceptable in these assemblies. Rudd and Prahl (2014b) conducted a Building America Focus Meeting on “Code Challenges with Multi-Family Area Separation Walls,” with participation from stakeholders in the construction and product manufacturing industries. They proposed a modification of the typical U347/U373/U336 wall, with an additional layer of gypsum sheathing on the unit-to-unit side of the wood framing; this would isolate the stud bays and make air sealing similar to typical exterior wall construction. However, industry stakeholders pushed back, citing cost and constructability reasons, including sequencing and the difficulty of installing clips through this sheathing. Industry stakeholders also noted that the proposed air sealing materials within the wall should be irrelevant to the fire performance of the assembly, but that work with UL (a request for an engineering opinion and/or a full-scale burn test) might be needed to move forward. The airtightness targets discussed earlier are covered in more detail in this section and summarized in Table 1. The 2012 IECC (ICC 2012a) provides a residential airtightness requirement in Chapter 4: Residential Energy Efficiency. It is a whole-house (as opposed to compartmentalization) requirement that applies to single-family and multifamily units. R402.4.1.2 Testing. The building or dwelling unit shall be tested and verified as having an air leakage rate of not exceeding 5 air changes per hour in Climate Zones 1 and 2, and 3 air changes per hour in Climate Zones 3 through 8. Testing shall be conducted with a blower door at a pressure of 0.2 inches w.g. (50 Pascals). The LEED compartmentalization requirement (USGBC 2010a) can be divided into the prerequisite (requirement) and credit categories. The requirement is covered in §EQ 12: Compartmentalization of Units (in Mid-rise Buildings); it is stated as an area-based (as opposed to volume-based) calculation. The area used in the calculation includes all surfaces enclosing the apartment, including leakage to exterior and adjacent units/common spaces. 12.1 Compartmentalization of Units: Demonstrate acceptable sealing of residential units by a blower door test. Follow the procedure described in the ENERGY STAR Testing and Verification Protocols for multifamily high-rise buildings, with an allowable maximum leakage of 0.30 cfm50 per square foot of enclosure (i.e. all surfaces enclosing the apartment, including exterior and party walls, floors, ceiling). 12.2 Enhanced Compartmentalization of Units (1 Point): Significantly reduce smoke and other indoor air pollutant exposure and transfer (1 point). Meet the requirements of part (a) above and perform a blower door test to ensure that smoke transfer is minimized. Follow the procedure described in the ENERGY STAR Testing and Verification Protocols for multifamily high-rise buildings, with an allowable maximum leakage of 0.225 cfm50 per square foot of enclosure (i.e. all surfaces enclosing the apartment, including exterior and party walls, floors, ceiling). The maximum unit leakage prerequisite was modified from 7.0 ACH50 to 0.30 cfm50 per square foot of enclosure (i.e. all surfaces enclosing the apartment, including exterior and party walls, floors, ceiling). Credit is given for projects that achieve less than 0.225 cfm50 per square foot of enclosure, rather than 4.0 ACH50 or ≤ 1.25 in2 per 100 ft2 of enclosure area. ASHRAE Standard 189-2009 (ASHRAE 2009) also specifies an airtightness target for the whole building (as opposed to compartmentalization), under “Normative Appendix B: Prescriptive Continuous Air Barrier.” It is stated in terms of cubic feet per minute per square foot of enclosure at a 75 Pa test pressure (CFM 75/ft2). c. Building. Testing the completed building and demonstrating that the air leakage rate of the building envelope does not exceed 0.4 cfm/ft2 under a pressure differential of 0.3 in. water (1.57 lb/ft2) (2.0 L/s·m2 under a pressure differential of 75 Pa) in accordance with ASTM E779 or an equivalent approved method. ASHRAE Standard 62.2-2013 (ASHRAE 2013) has a requirement for compartmentalization in multifamily buildings, under §8.4 “Other Requirements.” Although the current scope of this standard is “single-family houses and multi-family structures of three stories or fewer above grade,” the committee proposed to apply it to all residential dwelling units (any unit with sleeping quarters, toilets and baths, and kitchens within) (ASHRAE 2014). 8.4.1 Transfer Air. Measures shall be taken to minimize air movement across envelope components separating dwelling units, including sealing penetrations in the common walls, ceilings, and floors of each unit and by sealing vertical chases adjacent to the units. All doors between dwelling units and common hallways shall be gasketed or made substantially airtight. 8.4.1.1 Compliance. One method of demonstrating compliance with Section 8.4.1 shall be to verify a leakage rate below a maximum of 0.2 cfm per ft2 (100 L/s per 100 m2) of the dwelling unit envelope area (i.e., the sum of the area of walls between dwelling units, exterior walls, ceiling, and floor) at a test pressure of 50 Pa by a blower door test conducted in accordance with either ANSI/ASTM-E779, Standard Test Method for Determining Air Leakage Rate By Fan Pressurization,1 or ANSI/ASTM-E1827, Standard Test Methods for Determining Airtightness of Buildings Using an Orifice Blower Door. The test shall be conducted with the dwelling unit as if it were exposed to outdoor air on all sides, top, and bottom by opening doors and windows of adjacent dwelling units. However, current discussions (Brennan 2014) indicate that the target is being loosened from 0.2 CFM50/ft2 to 0.3 CFM50/ft2. The ENERGY STAR Multifamily High Rise program (EPA 2013) has a compartmentalization requirement of 0.3 CFM50/ft2, for both the Prescriptive Path (Version 1.0) and the Performance Path (Version 1). Apartments shall be sealed to reduce air exchange between the apartment and outside as well as the apartment and other adjacent spaces. A maximum air leakage rate of 0.30 CFM50 per square feet of enclosure is allowed. Finally, Lstiburek (2005b) discussed HVAC in multifamily buildings, which included a recommendation for a compartmentalization target as follows. To achieve compartmentalization unit airtightness should meet a minimum resistance or air permeance of 2 L/(s·m2) at 75 Pa (0.4 cfm/ft2 at 0.30 in. w.g.). The previous targets and recommendations are summarized in Table 1 below. a This conversion assumes all enclosure surface area, including adiabatic walls. IECC does not provide guidance on what surface area should be included. b Will be increased to 0.30 CFM50/ft2 enclosure in the near future (Brennan 2014). c The research team is now proposing a change to the New York State code requiring 0.30 CFM50/ft2 for multifamily compartmentalization (Maxwell 2014). Conversions were required for direct comparison between these standards; they were all converted into CFM50/ft2 of enclosure. The current ASHRAE Standard 62.2 requirements are clearly the tightest of the surface area-based standards. However, when the 2012 IECC requirement is normalized over the surface area of the tested townhomes (all surface area included in this calculation, including adiabatic walls), it is even more stringent than the ASHRAE 62.2 standard. This is due to surface area effects on small (1700- to 2000-ft2) townhome units, spread vertically over three floors (high surface area-to- volume ratio). In comparison, a compact (rectangular) 2000-ft2 house (two story with basement) would have a surface area target of 0.24 CFM50/ft2 at the 2012 IECC requirement of 3 ACH50. The 2012 IECC does not provide guidance about what surface areas to include in the calculation (only exterior surfaces, or exterior and adiabatic surfaces). . .